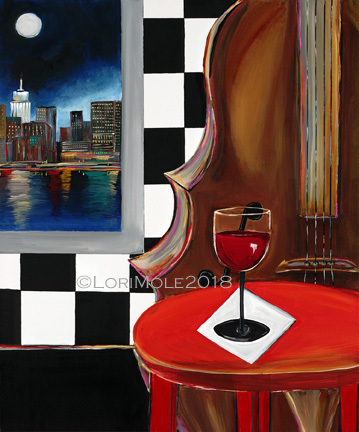 Lori Mole http://lorimole.com is a contemporary painter who combines her background of graphic design, art and music to create “The Music Series”. She recently moved to Orcutt in Santa Barbara County, CA from the Sonoma County Wine Country. California born and raised, she grew up in the small farm town of Orland playing the piano and clarinet, marching in Mr. Fairlee’s band. Lori received high school scholarships for graphic design and worked at local print shops. She graduated from CSU, Chico with a BA in Art focusing on Gallery Management and Printmaking. Operating her own Sonoma County galleries for 20 years awarded her multiple titles including “Top 100 Galleries of American Crafts in the USA” and “Best Art Gallery of Sonoma, Napa and Marin Counties”. Exhibiting her watercolors at her gallery led to connecting with “Wild About Music”, Austin, TX. 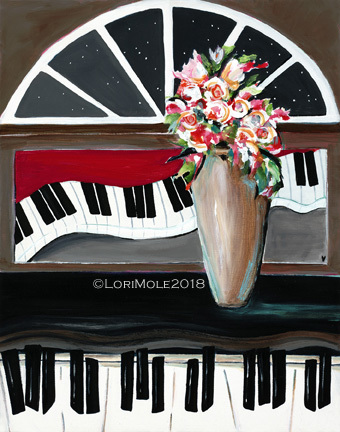 Gallery owner Shelley Meyer stated “She has a recognizable style with her bold keyboards and interpretations of music.” The gallery honored Willie Nelson with a themed show which highlighted Lori’s painting titled “Trigger” after his guitar. The de Young Museum, San Francisco’s “Bouquets to Art” event traveled to Santa Rosa. Lori’s painting “Dancing in the Dark” was selected and translated into a floral arrangement. Her artwork is collected by music lovers of all generations. 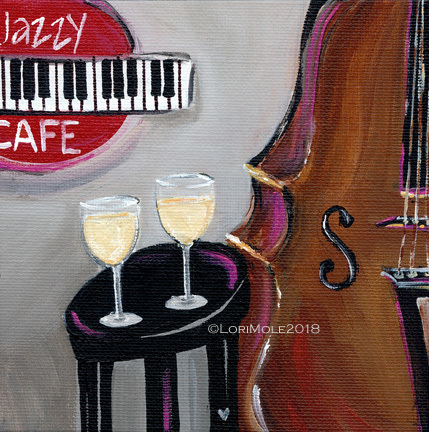 She exhibits in juried and invitational shows throughout the U.S. and in 2002, was selected as the artist for the Sedona Jazz on the Rocks Festival. Lori worked with Healdsburg, CA stone sculptor, T Barny as his Marketing Director for 10 year’s bringing his career to the next level. She now paints in acrylic, devoting her time to her own work in her Central Coast studio. California Girl Born Creative in 1962. 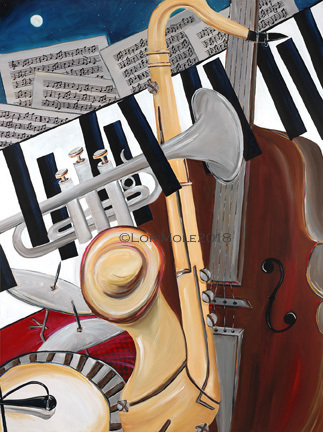 Painting “The Music Series” since 1992. I started playing the piano at a young age. It's my favorite instrument; I just love those keyboards. 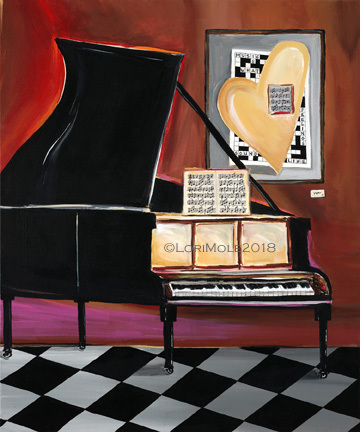 I set this grand piano in a museum setting complimenting the walls with a "music within my heart" painting. The crossword says it all: Music is what feelings sound like. "The Piano Room" was reviewed by one of the Top 10 Galleries of Chelsea in New York. Amsterdam Whitney Gallery's Curatorial Review Committee noted: We were "most impressed by your superb oeuvre such as "THE PIANO ROOM" which resonates with a profound visual narrative as you reveal the invisible within the visible through spatial aesthetics. "The spiritual artistic journey that you portray in "TOAST THE OAK" was quite impressive and was a triumph of personal expression and imaginative experimentation of technique and texture. We salute you on your aesthetically absorbing oeuvre which reverberates with a dynamic textural sense and powerful visceral shapes." Ruthie Tucker, Executive Director of Amsterdam Whitney Intl. Fine Art, Chelsea - New York 2018. "I highly appreciated your artworks published on your website and after a close look at your artwork. I believe that your vibrant art research, together with your creative imaginary like in your 'Toast the Oak', will bring personal and unique inputs"... into "Little Treasures", an exhibition scheduled for 2019. Paola Trevisan, Director & Curator of Trevisan International Art, Bologna, Italy - 2018. "We were enthralled by the emotive quality of "UNDER A BOWL OF STARS", which reflects your fine talent and vibrant visual intensity." Ruthie Tucker, Executive Director of Amsterdam Whitney Intl. Fine Art, Chelsea - New York 2018. Many times I enjoy putting a painting within a painting or a "VIEW". This idea comes from my huge background of owning art galleries and hanging many shows. It also showcases the New York skyline which I had recorded in my sketchbook. Like wine, it breathes in a mood with atmosphere. "Your compelling "THE VIEW" conveys your unique artistic vision of capturing the impalpable as you seize the essence of the emotional and physical experience. We are so pleased with your marvelous art and the positive energy of your stellar compositions." Ruthie Tucker, Executive Director of Amsterdam Whitney Intl. Fine Art, Chelsea - New York 2018.